Today was just one of those days, when if something could go wrong it did and it all began with me leaving my keys at home. 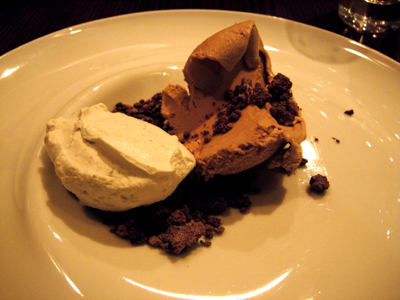 To soothe our rather frazzled psyche rather than tempt fate in the kitchen we opted for that safe haven that is Fenix. 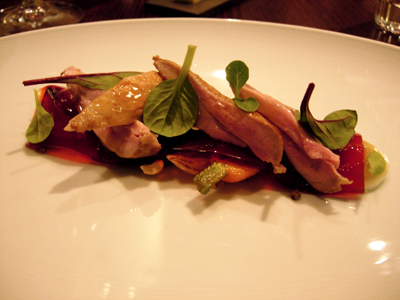 There has been some change at Fenix but from the dishes we had tonight they are still sailing on the right course. 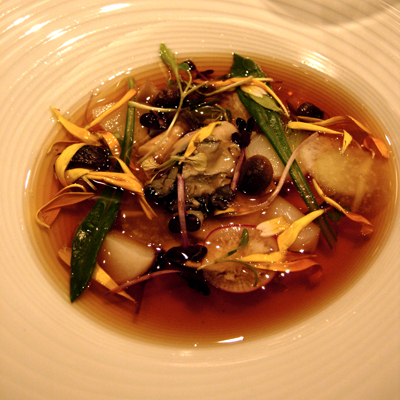 Smoked Tuna Broth with slivers of scallop and radish and an oyster floating in the middle - always an excellent way to start the evening. 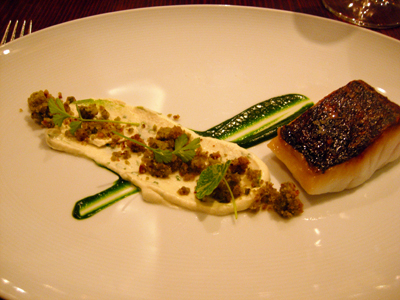 Confused might be your first reaction to this dish - Pistachio cake and Salt Cod? But as odd as the combination might sound, it works unbelievably well. 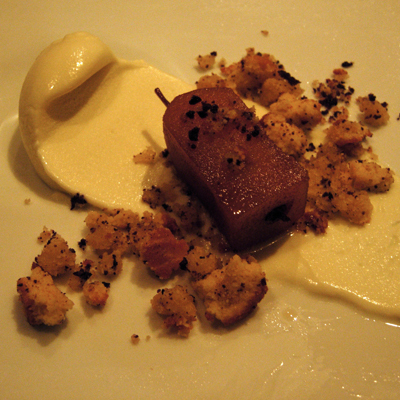 The cake is sweet, the mousee is creamy, the salt cod is salty but combined they just balance out. 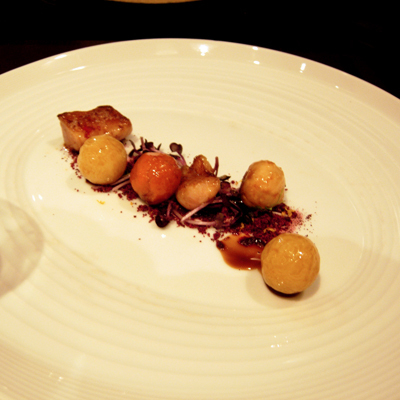 Every taste is intriguing and the wine match was perfect. The Cod is salted in-house and we enjoyed it's texture and the way it flaked into thick juicy pieces. 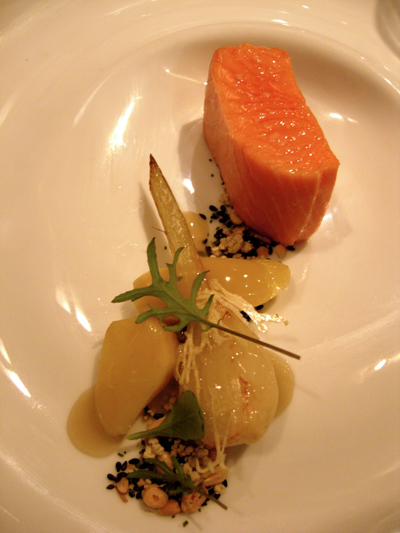 Salmon sous-vide at 50°, pink fir potatoes, baby fennel, black sesame seeds and pine nuts. If only all salmon was this good - soft and succulent it almost dissolves in the mouth. One of the true highlights on the night. I don't know how the carotene is made but it's dangerously good. 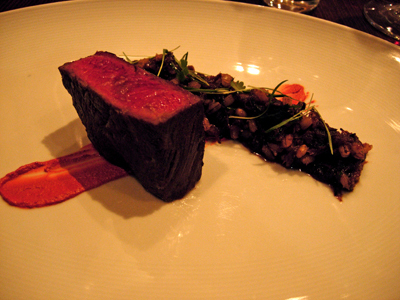 The sirloin was done perfectly, the oxtail and barley was a mix of rich meat and pleasantly chewy grains. 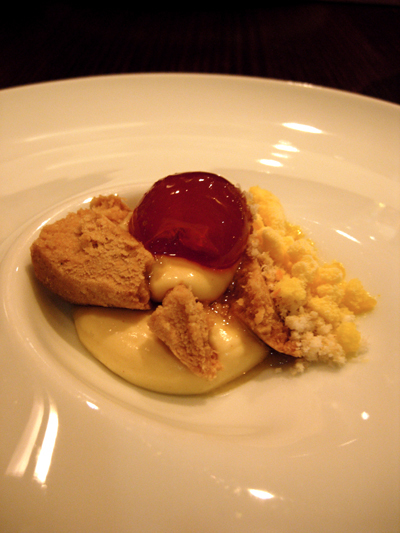 Candied Cumquat, burnt orange cream and macadamia biscuit - a must have dessert! It was really interesting hearing the reaction from a nearby table - the conversation changing to appreciative groans. 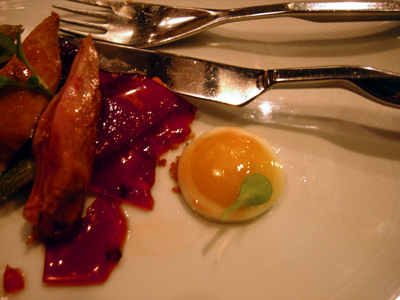 We last had this for my birthday lunch and it's still as good. The marshmallow isn't quite as large as it used to be but I think this size is probably more appropriate. 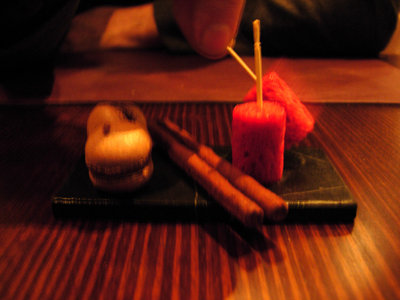 I was too slow with the petit fours!